The plentitude of hitch-mounted motorcycle carriers available can be a bit perplexing when you first start looking. This is simply because there are so many variations on the theme; so many different capacities and designs. Rage Powersports is no rookie in this industry and has a respectable collection of its own. One of the models which grabs plenty of attention, especially from those who rarely ride alone, is the AMC 600-2 Double Motorcycle Hitch Carrier. Rage’s AMC 600-2 double carrier does indeed carry two motorcycles at one time on the hitch of a single tow vehicle, something only large trucks and trailers could do before. It manages to do this with a heavy-duty aircraft aluminum deck, meaning it is very lightweight compared to steel models with the side benefit of being virtually rust-proof and very durable, which is welded to a very strong steel main hitch tube that is powdercoated for the same reasons. Though each rail is 75 inches (1.9 meter) long, the entire unit only tips the scales at 69 pounds (31 kg) and yet it can haul 600 of those same pounds (272 kg); that is more than enough for two big motocross machines in the 450 cc range, even older models. In fact, one of the rails can hold 400 pounds (181 kg) if you are only taking one motorbike along. As is standard with this weight class, you will need a basically ubiquitous two-inch Class III hitch or better and the 45.5 inch (1.2 meter) ramp actually stores right up next to this area to keep as much of the weight forward on the AMC 600-2 as possible. 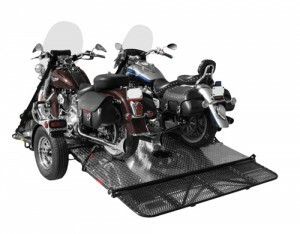 Simply plug your AMC 600-2 Double motorcycle carrier into your tow vehicle and install the ramp on the rail of choice – the closest rail to the vehicle should be loaded first – and it is ready to go. Loading is as simple as pushing the bike up the ramp and into the wheel wells and then using tie-downs to secure it in place. For the second machine, simply repeat the process and then store the ramp. It is actually quite an interesting feeling driving down the highway with one of these as the carrier does extend somewhat from the rear of the tow vehicle; be prepared for some strange sensations if you have never had something this heavy and long hanging off your rear-end. However, in practice, once used to the feeling, it is still far better than dealing with a trailer and the associated complications. Unloading the AMC 600-2 double motorcycle hitch carrier is just like any other hitch carrier – quick and simple as long as you can keep your balance and you have some upper-body strength. 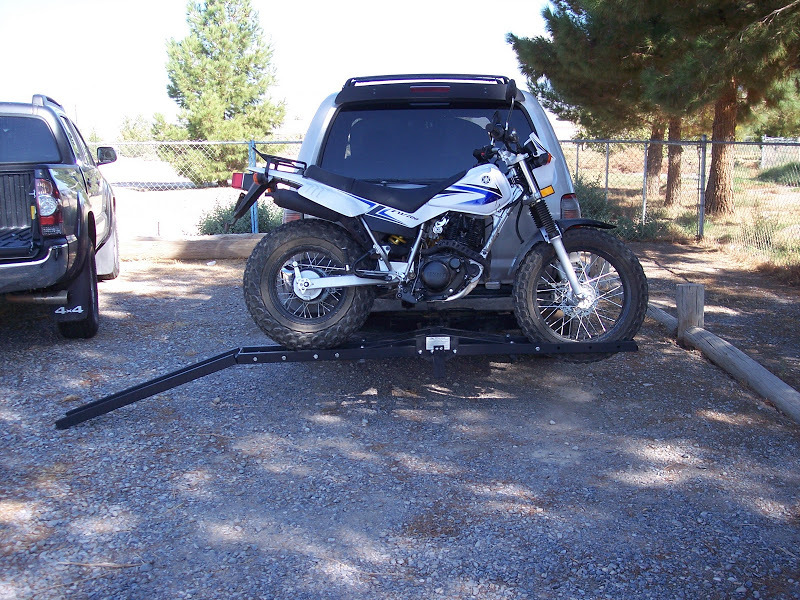 The AMC 600-2 double motorcycle hitch carrier already has an advantage over many in this sector of the market because it is capable of carrying two dirt bikes. This gives it a real benefit to those without any other way to bring two bikes along with them, but it also has the disadvantage of being rather large. That means you need to be sure that your tow vehicle is up to the task, so check all weights and specifications before you make the purchase. Rage Powersports has a best seller with the AMC 600-2, and any trip to a local dirt track will demonstrate this. One major reason for this is that the suggested retail for this carrier is only US$330, but it is easy to find for as little as $240 – and it carries TWO dirt bikes! A well-built, durable, and incredibly useful motorcycle transport method – it’s hard to beat the AMC 600-2 double motorcycle hitch carrier. The ubiquitous tie-down has a long and storied history; almost everyone who has ever had to move anything has some type or version of the modern idea of the ratcheting strap. Most are far more than any motorcyclist would really need – after all, how many motorcycles on the road today weigh more than a half-ton (choose your standard, both are about the same) and almost every material used to make them is capable of holding far more than that. 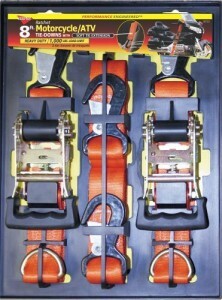 Below are some of the more popular and highest rated tie-down straps available. Though this is called a ‘review’, there is little to comment on except special features and how well-regarded the straps are by the people who use them since the whole concept is so very basic – if tie-down straps work, they are often good, plain and simple. Have a look and find the set you need. Keeper makes a very broad range of automotive and motorcycle storage, organizational and towing products in the United States and sells worldwide. 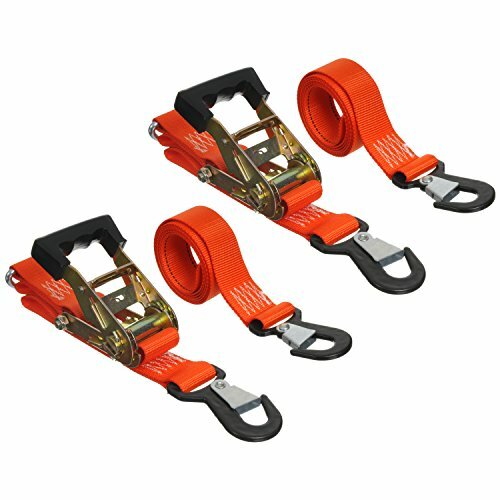 The model 05723 Heavy-Duty Motorcycle and ATV Tie-Down straps are made of a nylon webbing in an orange hue, have built-in soft-tie extensions to keep from damaging the bike, measure 1½ inches wide by eight feet long and are rated to handle 1000 pounds (454 kg). The material they are made of can withstand 3000 pounds before breaking – more than enough to safely hold a motorcycle in place even in a hurricane. A nice feature of the 05723 is the rubber-coated ratchet handle. The Keeper 05723 heavy-duty motorcycle and ATV tie-downs are sold in pairs for a suggested retail of US$30 but can be found for less. At the very basic end of the tie-down spectrum would have to be the Ancra 40888-10 Original Tie-Down; these are the classic tie-down in every sense, but they are also reputably reliable and long-lasting. This model has been available in one form or another for over two decades and many of those original products are still in use. Ancra makes the 40888-10 of nylon webbing – in red or black in this case – which is rated at 4500 pounds tensile strength and is designed for 400 pounds (181 kg) of working load capacity. 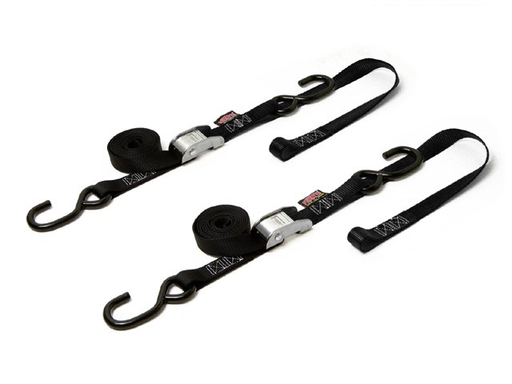 These straps measure 66 inches (1.7 meters) long, 1 inch wide, at the ends are the standard vinyl-coated S-hooks and the cam buckles are rated for 1800 pounds. The only reason that these are not at the top of this list is that they do not include soft-ties in their US$31 suggested retail price. But, for the common $20 asking price per pair of 40888-10 Original tie-downs, one can easily find a solution for this when purchasing a tie-down which will last as long as this set will. Though the name is truly indicative of their primary business, Discount Ramps makes a variety of motorcycle rider-friendly products. One of the more popular in their line-up is the 8 Piece Motorcycle Tie-Down Kit which is truly a solution in a box (but not a good box). It contains four two inch wide ratcheting S-hook straps made of nylon webbing rated for 3000 pounds of tensile strength and a 1500 pound (680 kg) working load, four one by twelve inch soft loops which can withstand 3600 pounds of breaking strength and a 1200 pound (544 kg) working load capacity, and one not-so-great or well-fitting plastic case (just recycle it). Many small shops have made a habit of purchasing this kit for professional use and racers are known to be quite happy with them as well owing to their usefulness and durability. So, picking up this kit for its US$65 asking price – or its more likely cost of less than $50 – for using on a personal motorbike for an occasional transport will be a connection you will likely have for life. 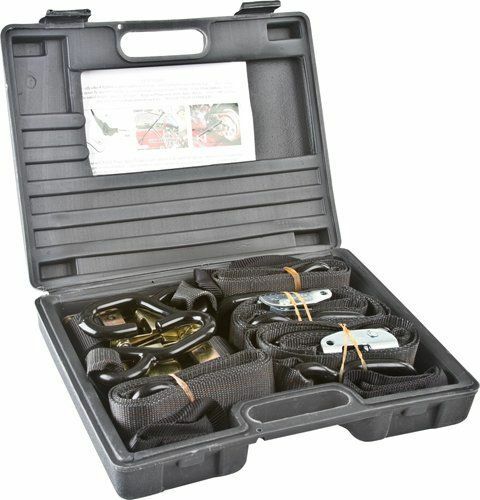 The Discount Ramps 8 Piece Motorcycle Tie-Down Kit is a very good value and a complete set of every strap you need to safely move a bike from one place to another. NOTE: There are other sets sold by Discount Ramps in a range of configurations (differing types of hook) and they are all rated fairly highly. Powertye is what many consider the Nike of strap manufacturers – they make very durable, reliable, and strong tie-downs which also happen to have a sense of style, and they promote professional athletes. The Powertye 1½ inch Fat Strap with Soft Tye is in about the middle of their line-up and works well as an indicator of all the tie-downs and similar products they produce. The Fat Straps are made with nylon webbing rated for 6000 pounds of breaking strength and maintain a 1500 pound (680 kg) working load, they adjust between six and twelve feet in length, have vinyl-coated S-hooks, make use of built-in ‘soft tye’ straps – meant to protect the bike in transport from being damaged – use chrome-plated ratcheting mechanisms, are security stitched and come with a lifetime warranty. They are durable and have a high level of attention to detail and this really shows when strapping a bike onto a hauler. Highly rated is an understatement when speaking of Powertye tie-downs and, for a suggested retail of around US$27, the 1½” Fat Strap with Soft Tye set will help you understand why that company’s products are so very well respected and why they sell so many of their straps. It seems like new ways to transport motorcycles are always popping up at local shops and the hitch carrier is one specific area seeing continual development. Entering in this segment are a host of different types differentiated most significantly by carrying capacity; such load limits are usually big, round numbers. In the case of the Masterbuilt HMXCR Hitch-Haul Steel Motorcycle Carrier, that number is 500 pounds (227 kg). That may seem like a high enough number for carrying some of the lighter sportbikes, but Masterbuilt only recommends motorcycles with less than 450 cc be hauled by the HMXCR Hitch-Haul carrier due to what they call “uneven weight distribution.” Even so, that does allow some monstrous on and off-road machines. The entire unit is made of steel, as the full name implies, and is powdercoated – in black, of course – so as to be impervious to weather, abuse and time. 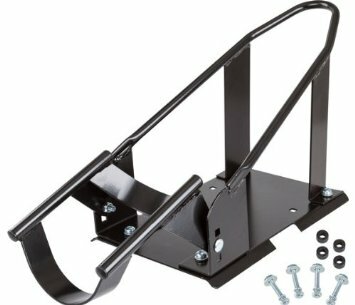 It is very strongly built and will fit the standard two inch hitch receiver, comes with a built-in ramp, has unique ‘bolt-in pins’ which secure the tires in place within wheel wells, and it has two steel tie-down ‘lugs’ welded firmly in place for rock-solid security. Be sure the correct Class of hitch is used; in this case anything Class III or above is fine. And the entire HMXCR Hitch-Haul carrier only weighs around 50 pounds (23 kg) on its own. 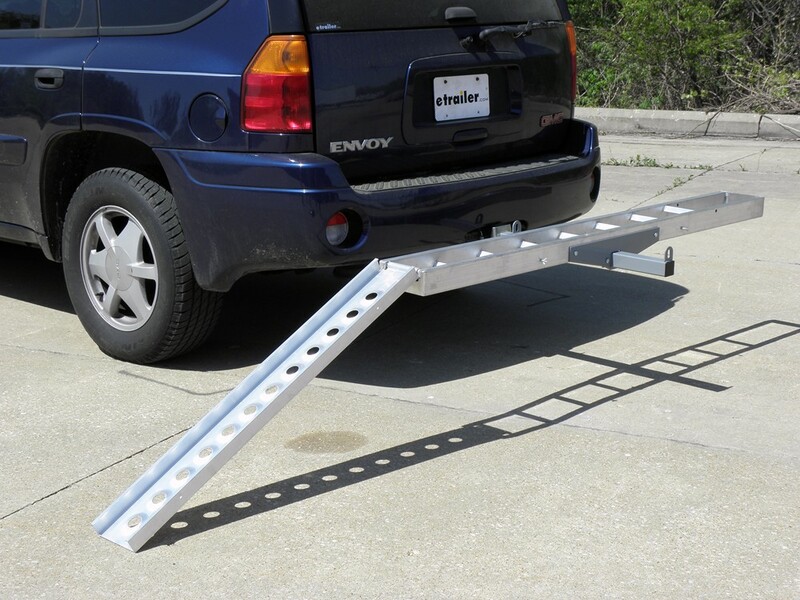 Be sure to follow the recommended weight and displacement limits when using the HMXCR Hitch-Haul for at least one reason: the ramp is fairly short. With the target 450 motocross machine, though, loading is fairly easy and the 76 inch (1.9 meter) deck holds virtually any wheelbase that fits within the stated limits. Having help doesn’t hurt, especially when unloading, but a coordinated person can do it all. Under way the carrier works very well and is quite solid compared to some on the market; this is courtesy of the included anti-tilt mechanism. As is often the case, the further back your hitch is from the rear set of wheels on the tow vehicle the more it will affect its handling. 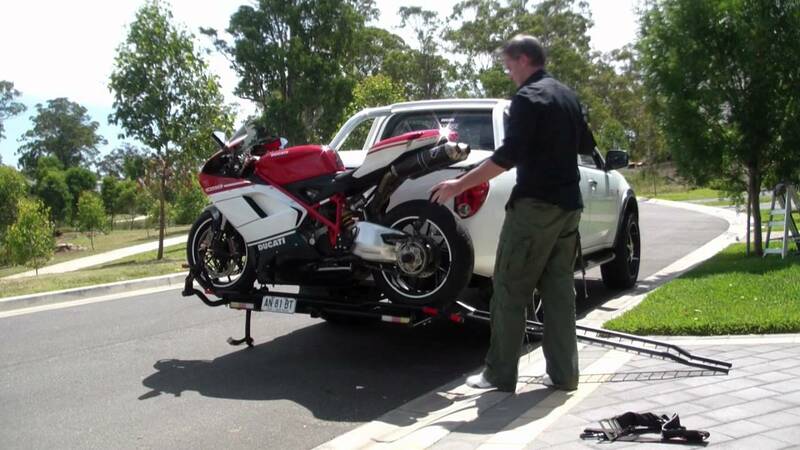 The purpose of the HMXCR Hitch-Haul motorcycle carrier is to allow a motorbike to be transported without the need of a pickup truck / lorry or a trailer, and this it does exceptionally well. Suggested retail for the Masterbuilt HMXCR Hitch-Haul steel motorcycle carrier is set at US$200, though you know it is out there for much less if you look around just a little – as per usual, contact your local dealer first. This carrier is built to withstand some punishment within its rather generous limits and is well worth even twice the money; moving a dirt bike has never been easier. Wheel chocks have become more popular in recent years as more manufacturers enter the fray to sell their wares; not too long ago there were only a handful of companies and the prices were more than twice what they are today. In fact, they are so widely available that even the popular online retailer Amazon sells a number of them at deep discounts. Here are a few more options for those in desperate need of a stabilizing wheel chock for either transporting or storing a motorcycle. Rage Powersports has a large line of motorcycle transport solutions and accessories for your tow vehicle, and their Black Widow Self-Locking Motorcycle Wheel Chock (BW-CH-DX1) fills their requirement for a solid, stabilizing device. This wheel stop is constructed from heavy-duty black powdercoated steel with aluminum wheel guides for exceptional strength and durability. It has a three-way adjustable pivoting arm and a two position wheel cradle to accommodate motorcycle wheel sizes from 16 to 21 inches so that it can handle anything from sportbikes to cruisers. And, it only weighs in at 18 pounds (8 kg). It is very easy to use, but it can be difficult when it is not bolted down as it tends to slide on its rubber feet a bit; that’s easy to do as it has two pre-drilled holes and all the necessary hardware so that it can be mounted to a truck bed, trailer or on the floor. Rage Powersports sells the Black Widow self-locking motorcycle wheel chock for US$125, though it is easy to find one for less than $50. Now we will look at what many consider the top-of-the-line in motorcycle transport and storage – the Condor PSTK 6400 Motorcycle Wheel Chock. Made with the highest quality aluminum – to keep it light, strong and rust free – with all-steel mounting hardware, the PSTK 6400 is very well-made and should last longer than even you will. 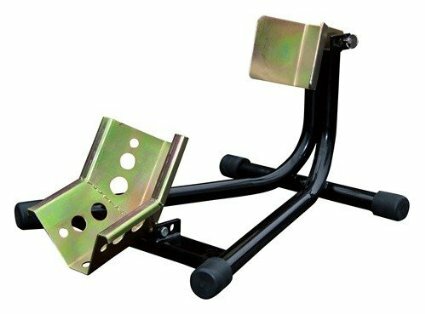 In fact, with the included quick-release kit, it is possible to have this chock mounted on your floor, in your truck and on your trailer by simply switching it from place to place when you need it. It is fully adjustable and the design is such that it can hold wheels from 14 to 22 inches, tires between 80 and 220 mm, and up to 3000 pounds (1361 kg) – and yet it only weighs 31 pounds (14 kg) itself. What is also interesting here is that the unit itself will fold down when installed to only six inches in height. Using the PSTK 6400 is very simple and its super-high quality construction really shows in how smooth it is to operate and even adjust; it will hold up any bike if the wheel fits. 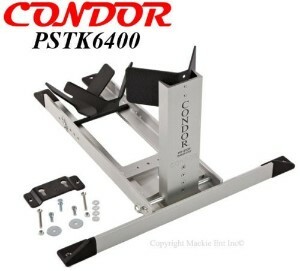 You do pay for the high-end nature as the suggested retail price for the Condor PSTK 6400 motorcycle wheel chock is US$272, but it is often on sale for less than $220. Once you buy the Condor, you will only need to buy another chock should you buy another motorcycle. On the opposite side of the expense chart, as motorcycle wheel chocks go, there exist the very basic units which are designed to be mounted and have virtually no free-standing capabilities whatsoever. Superior Supply has the perfect product if that is what is needed – the simple Stainless Removable Motorcycle Wheel Chock. As you can see from its name, this wheel stop is made from stainless steel, in tubular form here, and it comes equipped with steel bolts which are designed to let the chock slide into or out of its mounted position so that it may be relocated easily. 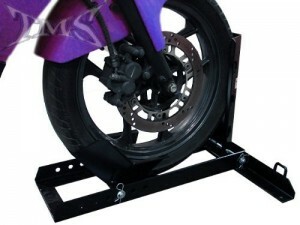 It should fit most motorcycles due to its eight inch wide opening, but it is neither fancy nor self-locking so tie-downs should always be used when employing this chock, just to be sure of safety. 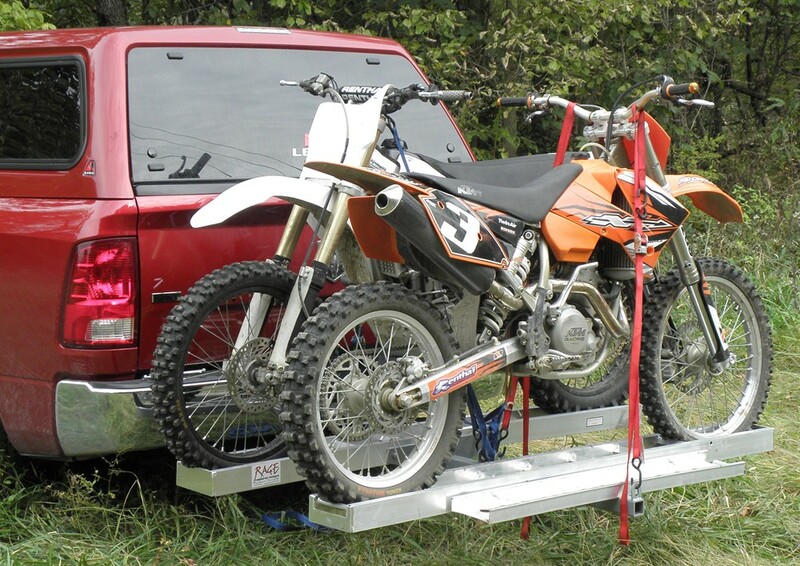 Though basic, the Superior wheel holder is a good addition to any motorcycle transport, be it truck bed or trailer. 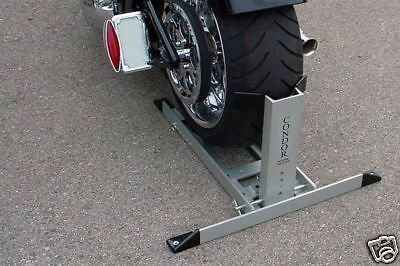 Suggested retail for the Superior Stainless removable motorcycle wheel chock is US$29.50, so it is a minor expense for a major solution to stability. 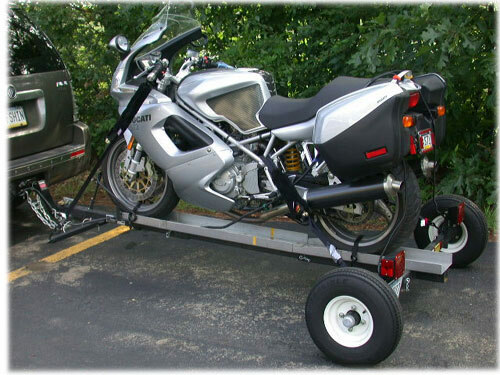 Owning a motorcycle trailer or carrier is only one part of what you need to safely transport a motorcycle. Wheel chocks, tie-downs, bike locks and similar security measures are necessary if the bike being moved is important and it needs to avoid being damaged or stolen. The humble wheel chock – or ‘wheel stop’ or ‘wheel holder’, whatever you call it – will probably be the most expensive trailer\carrier addition of these, and it is important that the correct model for the application be acquired or it might be essentially useless. Below are some of the better rated models of chock, with an important eye on each specification, so that you can be sure you get what you need. Starting out with one of the best values out there we have the Smi Self-Locking Motorcycle Wheel Chock, which is made to fit wheels between 17 and 21 inches in diameter and weighs in at 20 pounds (9 kg). It is made with a frame of strong, black powdercoated steel and uses aluminum for the construction of the tire cradles. Rubberized plastic feet are at all four feet and it comes pre-drilled for mounting either temporarily or permanently in a truck bed or trailer with the complete and included hardware. It is designed to wrap around the front wheel as the bike is pushed forward and lock it in place once it reaches the front upright. Easy to use, simple to install and built to last, the Smi self-locking motorcycle wheel chock is a phenomenal buy at a suggested retail of only US$75. When speaking of saving some money on a good product, the Superior Steel Self-Locking Removable Wheel Chock has to come to mind. After all, it sells for US$79, and has some features others in this area lack. One of those is the removable nature of the chock; the weight of the bike holds it in place and all one must do to pull out the wheel holder is remove the bike and slide the unit backwards – off it comes. Of course, this indicates that this device is built to be installed on a trailer or in the back of a truck bed – it will not stand alone. Made of high-carbon steel for strength and powdercoated black for improved durability, this Superior chock is five-position adjustable so that it can fit a wide variety of motorcycle wheels. All of that adds up to the chock and hardware weighing in at 28 pounds (13 kg) total; it can be used in a truck bed, a trailer or the floor, and it is a one-person operation to install, load or remove the unit. The Superior steel self-locking removable wheel chock is a very flexible stability device with few true competitors. 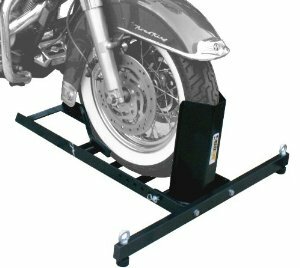 T-Motorsports is a well-known entity in the motorcycle transportation market – their hitch-carriers are seemingly ubiquitous. Thus, when looking for a wheel chock, one needs to look no further than their Heavy Duty Adjustable Self-Locking version. Made from steel and powdercoated black for protection from the elements, this wheel stop automatically locks the bike in place as the front wheel is pushed into place. 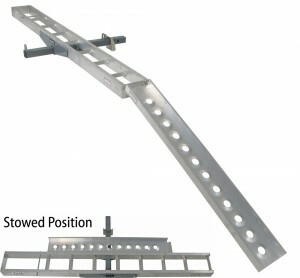 This model is meant to be installed in the back of a truck, on a trailer or on a garage floor, so all-steel hardware is included for this purpose. It is also four-way adjustable to give it the ability to fit a wide array of motorcycle models. Loading and unloading is a one-person job with this unit, and mounting it is made very simple with four pre-drilled holes. The 19 pound (9 kg) T-Motorsports heavy duty adjustable and self-locking wheel chock retails for US$45, but it is easy to find it for less. As innovative ideas for carrying a motorcycle or scooter from one place to another without actually having the pleasure of riding it, the Tilt-A-Rack motorcycle carrier certainly appears to be an elegant solution. Of course, the Tilt-A-Rack design falls in line with the many hitch-mounted setups in most ways, with the very notable exception that the unit itself is both loading mechanism and the carrier. Simplifying the process of the load is an attribute which we can all appreciate.Tilt-A-Rack is made by none other than Tilt-A-Rack, as you might expect, and is made of aircraft grade aluminum for strength, rust-resistance and light weight. It is also available in three different carrying capacities: 200, 400, and 600 pounds. This variation allows for the carrying of many different types of bike, from motocross machines to trail bikes to many classics. To install the Tilt-A-Rack, your tow vehicle will need a Class III hitch or better; check the tongue weight rating for details. As long as your auto can handle it, this carrier will function on it. The mechanism allows you to forgo the idea of a ramp entirely, though it does have a slide-out extension for taller cars and trucks – in effect, a small integrated ramp. Sitting 19 inches from the rear of the vehicle allows for many bike models to be accommodated easily with the simple auto-locking design making the loading process easy and worry-free; the secondary benefit is solid stability as the weight of the motorcycle holds it level by nature (gravity and a locking pin). The tilt is slanted to roll the bike towards the passenger side for unloading away from traffic if you must park close to it. The Tilt-A-Rack comes complete and almost ready to go, just a few steps and you can have it in place on your hitch within minutes after the delivery driver drops it off. Of course, this is only if you do it by sight and feel – the instructions are sub-par. It does appear to be a tiny bit rough around the edges, but the welds are very nice and it feels like it would work fine for military duty. Loading is really quite simple and can be done solo provided you have a long reach. You likely already know of hitch-mounted motorcycle carriers, especially if you have been to any sort of bike race in recent years. Even if you have simply hopped on the highway and come up behind an RV carrying a scooter on its backside, then you have probably seen one of these. The Rage AMC-400 is a lightweight aluminum motorcycle carrier designed for carrying up to a 400 pound bike – it’s best suited for dirt bikes or dirt-biased dual-sports.Rage makes the AMC-400 out of rugged, rust-resistant aircraft aluminum and will handle a bike with an overall length of 75 inches and a rear tire up to 5.5 inches in width. A ramp of the same material – with a solid, full-width attaching lip – is included with the AMC-400 and mounts to the carrier when not in use. 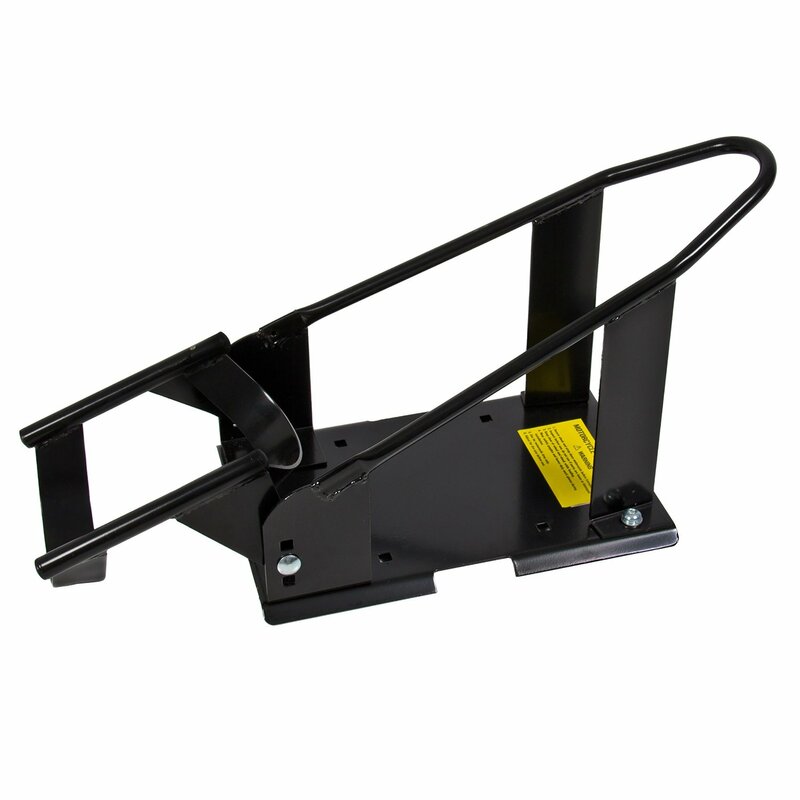 Given its 400 pound capacity, the unit is only suited for Class III hitch or above. The 18 inch hitch tube is fully powder-coated and made of solid steel. To stabilize the motorcycle and carrier assembly in its mount the AMC-400 includes a reverse anti-tilt device which locks it in place. For installing the carrier, all you have to deal with are eight nuts and bolts and then an easy lift to hook it into your tow vehicle’s hitch. 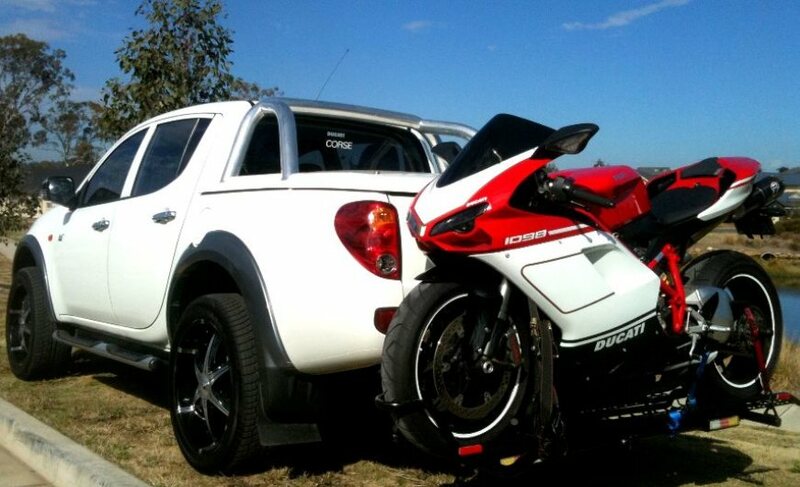 A carrier is considered successful if it does its job without causing damage to either the motorcycle or the tow vehicle – simply get it from where the bike is to where it needs to be without violence. The Rage AMC-400 does this and more; it is well-designed, strongly built and easy to use for anyone who can easily move their dirt bike around a garage or at the track. Looking at the AMC-400, you can see that they have made some concessions to cost, but it is of solid construction and there are no worries about it being able to live up to its billing. Installation is as easy as advertised, and it can be done solo quite easily; it may even be easier alone. It’s lightweight enough to also be quick to mount. Pushing the bike up the ramp is simple and again can be done with just one person, but it is easier with two as one can be tying things down while the other holds up the bike. All in all, this is a quality carrier. The Rage AMC-400 retails for around US$130, but shipping can cost extra or may be free if you look hard enough. It is suggested that you pick up some wheel ties when you make the purchase, though, as they are not exactly a common item in a rider’s garage. And, a hitch pin is not included, so you will need your own. Even with the caveats, though, the Rage AMC aluminum motorcycle carrier is a very good deal for a very useful device. 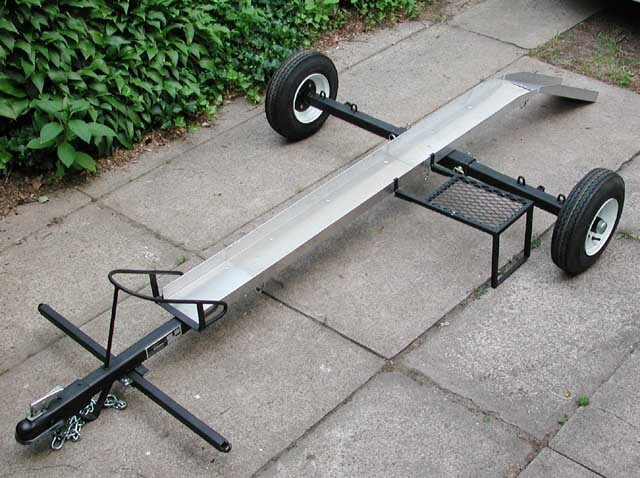 The Drop-Tail Two-Up Cruiser / Sport Bike Trailer is the ultimate in un-covered motorcycle transportation, and likely the most expensive as well. Luxurious is an applicable description of this design, along with flexible and capable, but those are standard with Drop-Tail. The only thing which keeps people away is the cost of entry, but these units can be found used in some areas; do some searching and an old Internet auction site could get you one reasonably quick.A surprising feature of the Drop-Tail line is that they are foldable for very easy storage, though they do weigh in at 660 pounds without a load, so you need some strength to move it around. 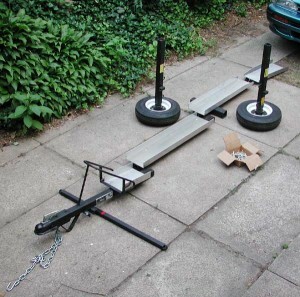 The total weight can increase quickly, though, and this thing can take it easily with a maximum load of 2100 pounds. Certain accessories will allow that number to be reached ever more quickly if you bring along a substantial amount of gear, fuel or your friend’s bike. Made of high quality steel and aluminum with an integrated deck, which polishes up rather nicely, the Drop-Tail unit is a capable Class II trailer. The extra space is immensely useful for a motorcyclist on a long trip, or one who regularly transports bikes for shows or for shop work. It also means that this trailer can carry an ATV, or two, or a golf cart, or UTV or you can just use it to haul a ton of your stuff – plenty of flexibility is included. Even when the Drop-Tail is folded, it has a useful storage shelf for keeping your towing accessories all in one place while taking up less space. The integrated lighting is then safely tucked away and a powder-coated finish means that it is durable enough to be opened and closed often. The innovative part of this trailer is its namesake, a rear half which can be hydraulically lowered to make loading very simple and safe – a drop-tail. And, obviously, there is not a need for any ramps, though there is a tailgate which serves as a small extension. Plus, the Two-Up Drop-Tail model comes equipped with two motorcycle front wheel chocks already installed; yet another safety and comfort feature to add to this one’s list. Your tow vehicle must be able to handle the weight and the two-inch hitch – a ball hitch is needed – and the Drop-Tail is relatively large with a maximum length and width being 126 and 91 inches, respectively. With the proper tug up front, this thing will be stable at above-legal speeds due mostly to the fact that it rides on 13 inch wheels which are held to the chassis using high-spec torsion axle. It must be said of this trailer that it is well-made and very well-constructed; the Drop-Tail is a professional grade trailer. Being so, though, also means that it is heavy, but it can also carry more than your average pick-up truck and yet fold away into a corner of your garage. Taking time to get used to its design is highly recommended. Once you do, and you take the Drop-Tail out on the road with your motorcycle loaded, it feels amazingly safe and rides very smoothly even across unkempt byroads around this area. It will cost you a significant amount at a retail price of US$2,850, plus the cost of a spare wheel and other likely accessories, you will need to have a reason to justify it – hedge fund managers need not worry. However, this Drop-Tail Two-Up trailer is a vehicle which will actually get you as much attention as what you have on it. You get what you pay for, and the Drop-Tail is a prime-time ready motorcycle carrier which will serve many more purposes in its long lifetime. Using a trailer to carry a motorcycle across the city, state or nation can make a great deal of sense at certain times. You may be hauling a race-only machine or taking a trail bike out for some play in the hinterlands. Even if you own a pickup or van, sometimes there are better uses for the vehicle space; and other times you know that your sedan is going to be more fuel-efficient even with the additional tow weight. 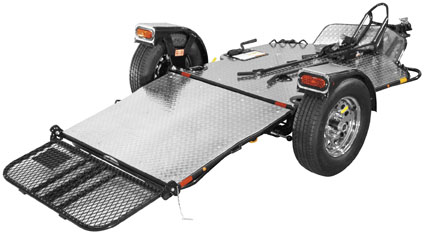 However, there are many out there who feel that even a single-rail folding trailer is a bit like overkill.MotoTote has that covered with the MTX Sport Motorcycle Carrier; this unit eliminates the wheels altogether and hooks right into the trailer hitch mount at the back of your tow vehicle. It’s a brilliant idea which has been around for some time now. In fact, the concept has more than proven itself in countless applications – this is one item in which the RV (caravans to some) crowd helped the motorcycle industry, and vice-versa. The MTX Sport is made of textured, polyester powder-coated steel and includes a ramp coated in the same manner. The heavy-duty construction allows for a 550 pound carrying capacity, and thus will hold most modern 600cc and liter class sportbikes with a full tank of fuel. The included ramp is long enough to make loading simple at 56.5 inches long and stores on the assembly when you are carrying a bike. 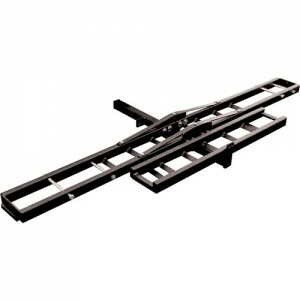 The entire unit only weighs 63 pounds and is compatible with any Class III or above hitch with a 2 inch square coupler. The unit has an adjustable wheelbase to match that of your bike, and even the distance it holds the bike from the rear of your vehicle can be adjusted over 20 inches. For stability, MotoTote has developed an exclusive Zero-Wobble mechanism and the MTX Sport has a mono-directional design; this puts a wheel stop and five-inch sized loop in front of a wider rear end allowing a rear tire as wide as 8.5 inches. This is also reversible to suit your tow vehicle’s design and where you unload. Safely thought out tie-down points are spread as far as 29 inches wide at the front end with a total of four specific loops welded strongly onto the carrier. Assembling the MTX Sport Motorcycle Carrier is simple and only requires the use of one wrench and one person. And, once you are done with the unit, simply pull it off your hitch and store it in about the same space as you would need for a bicycle. MotoTote is obviously considering the many times a rider is left alone to load his or her motorcycle – and the fact that many of us have too much stuff and not enough space. Once you put hands on the MTX Sport, you can see and feel the quality of this tool’s construction quite readily. 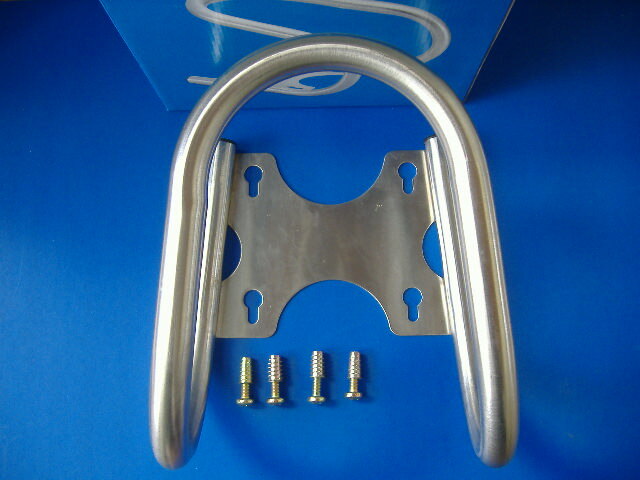 The welds are very well done, the powder-coating is purely professional, and the overall design is ideal for its purpose. 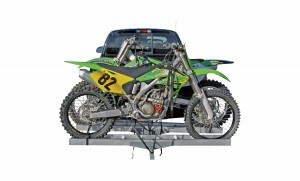 Quickly assembled, easily locked in place on the tow vehicle’s hitch, and almost as easy to load up with a motorcycle. Having a second person to help out, especially if there are any spare tires sticking out back, is not a bad idea. However, one reasonably fit person can accomplish the entire task with little stress. The MTX Sport rides on the back of the vehicle almost imperceptibly if you are adept at pulling a trailer, otherwise it feels a bit odd at first. Once you are used to it, though, you will wonder why you didn’t patent this idea first. Yes, the MTX Sport is the epitome of minimalism for transporting a motorcycle. The retail for the MotoTote MTX Sport is at US$479, but it can be had for less through some retailers and the manufacturer has price cuts regularly. 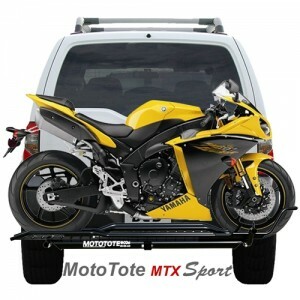 If you only have one bike in need of moving around, and you have the appropriate setup for it, the MTX Sport Motorcycle Carrier may be the easiest solution to a scary problem, ever. If ever a product lived up to its name, the Trailer in a Bag would be about as perfectly descriptive as you can get – it aptly says what it is. The unit would appear to be about as basic as possible for being considered legal on the road; in fact, the most heard comment seems to be that the wheels look as if they belong on a child’s tricycle. However, the many people who have taken the jump and made use of the Trailer in a Bag have been rather complimentary of how it performs – honestly, do your own search and you will find the same thing. Its main claim to fame is the primary reason for making the purchase, and that is its portability. That means that if it only performs adequately as a trailer, its ability to break down and be carried in a car’s trunk would make this carrier worth looking into seriously. So, what is the Trailer in a Bag? The Trailer in a Bag is made in the state of Florida by a company whose sole focus appears to be this product. This is often a good thing since you have to make something well to continue existing in the market. The Trailer in a Bag is made of structural-grade steel (the kind used to build your average skyscraper) that is 1/4 inch in thickness, yet it still remains light; it only weighs 140 pounds, with the heaviest single part tilting the scales at only 33 pounds. The coupler is the standard 2 inch with a 3500 pound rating, and the spindles on each axle are rated at 1000 pounds each. Attached to that are eight-ply tires coupled to bearings rated for 7500 RPM, and designed for regular use. The upside of the light weight also includes a tongue weight of between 120 and 160 pounds, which means it will work with virtually all hitch types. The length of the trailer, when assembled, is nearly 6 feet long (71 inches), and even that can be extended with an optional accessory kit. That is only one of the many possible changes you can make to the unit in order to suit your taste, needs or local regulations. On-road conspicuity is handled with a proper lighting setup; though it is rather simple, it does work. The wheels sit around 60 inches apart for added stability and it will work very well on the highway according to many owners. The newer models have been designed to use a condor wheel chock which increases the overall stability of the bike and trailer combination, and gives you some peace of mind. Probably the most important part is that you can carry a motorcycle weighing up to 2000 pounds at any legal speed, you can load a bike onto the Trailer in a Bag alone, it works very well with virtually any configuration of towing vehicle, and it collapses down to fit within a 48 inch long duffel bag included with the purchase. And, assembly is said by the manufacturer to take around five minutes or so once you are experienced with the process. Trailer in a Bag is an honest revelation in convenience as far as motorcycle trailers are concerned; it will suit almost any motorcycle in production today, though some will require the extension. The highway manners of the carrier are very respectable, and it handles fine behind a medium sized sedan. It’s rather small size actually helps here, but you should practice with it before setting off on a long trip with no experience. If you live in an apartment or you have limited space at either your home or your destination, the Trailer in a Bag will fit in a space similar to that of large suitcase. All in all, the Trailer in a Bag outperformed expectations and it can be recommended without worry, but be sure to take care good care of it. The base model will set you back US$1195, but there are probably some accessories you will want to purchase. 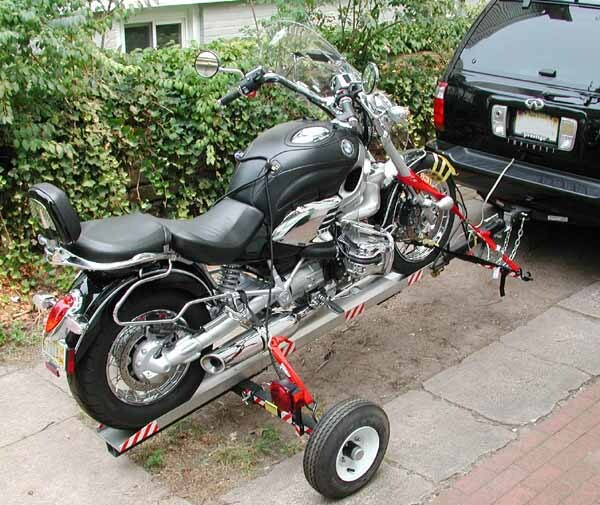 And, there is a double-rail version for pulling two motorcycles which sells for $1000 more, with the same accessories applying here as well. 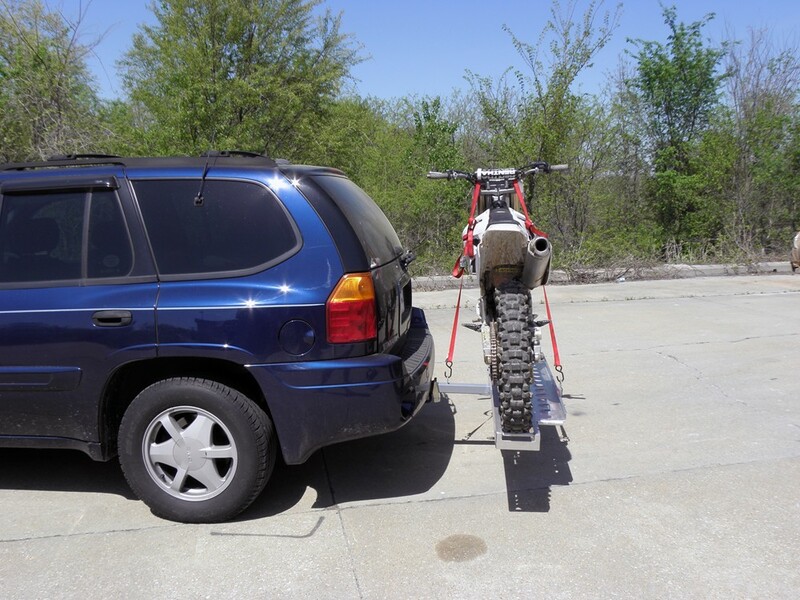 The Trailer in a Bag is a great solution for transporting your ride.